Mesoporation is a complex technological process that delivers active ingredients in the deeper layers of the skin without penetrating the upper layers of the skin. It is an extremely gentle process, safe and painless. 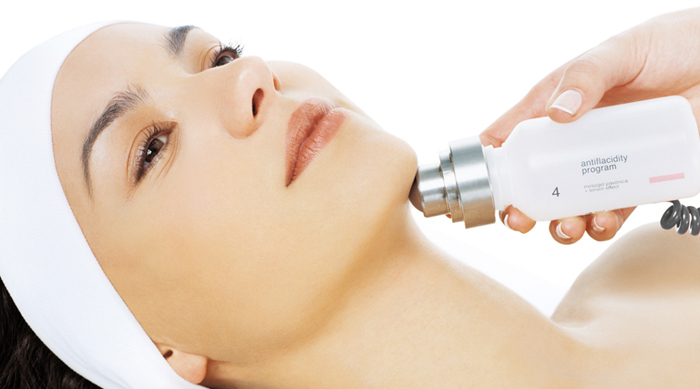 It is generally combined with a peel or a medifacial but can also be done independently. While mesotherapy involves use of needles and post procedure swelling and redness, mesoporation does not need any recovery time. First the clients skin is evaluated to assess for deficiencies, For example – lack of moisture or collagen or pigmented spots on the face. Then the skin is degreased and cleansed. The solution containing the necessary ingredients is uniformly applied on the skin. The mesoporation probe is then gently moved on the skin. The probe generates rapid electrical impulses causing tiny microscopic channels to open and facilitate delivery of the active ingredients to the deeper layer of the skin. These channels are temporary and close in seconds. The procedure is continued till the active solution is completely dried up which indictes complete absorption of the solution. The procedure gives immediate results and also extended delayed results. This procedure can be repeated weekly and in combination with medifacials can be repeated monthly.